Recent studies have shown that about two-thirds of adults in America are either overweight or obese. So are about 30% of children. With statistics like these, it’s not hard to understand why healthy grocery shopping is important for not only you, but also for your family. This is especially key given that nearly 50% of children of overweight parents are likely to be overweight themselves. You know what it’s like to be at risk for diabetes, back problems, heart conditions, or uncomfortable and insecure because of your weight. You don’t want the same for your children. 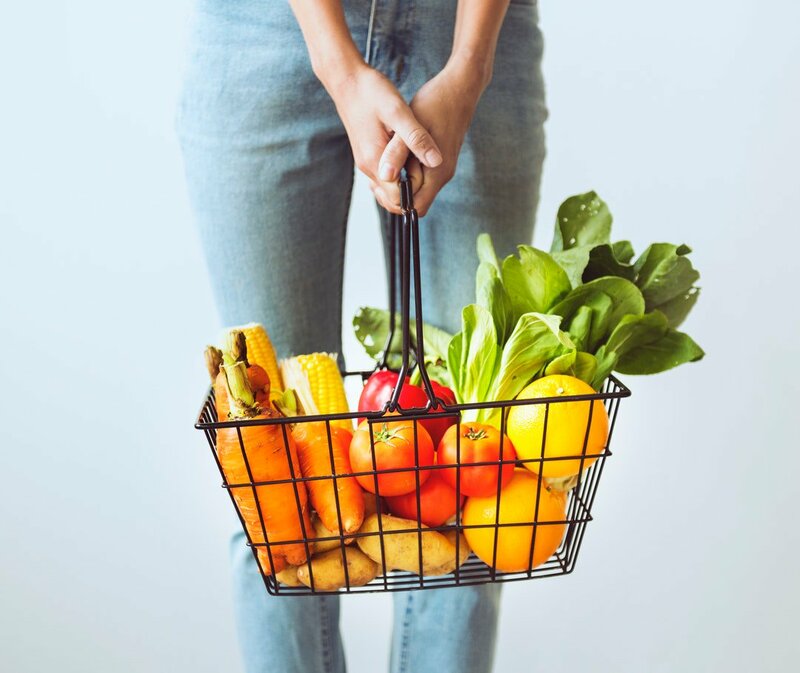 In this post, we’ll teach you everything that you need to know about how to grocery shop the healthy way. When you’re ready to build up a nutritional grocery list, read on. We know that it can sometimes feel like rocket science to try to decipher the nutrition facts and ingredients lists on food labels. While you don’t want to get obsessive about the exact nutritional content of everything you’re eating, it’s important to have a rough idea of what to look for and what to leave out. First thing’s first: avoid as much processed food as possible. Processed foods contain massive amounts of sugar and they’re high in calories without much nutritional payoff. They also contain a high amount of vegetable oils and corn syrup, which turn into trans fats. In short: they don’t belong on a nutritional grocery list. Instead, look for foods that are high (AKA, have more than 20% of) fiber, A, C, and E vitamins, potassium, magnesium, calcium, and iron. Aim to steer clear of foods that have over a 20% value of sodium, cholesterol, saturated and trans fats, or fats in general. Now, let’s go on a quick tour of healthy grocery shopping aisle by aisle. Remember that planning your meals ahead of time as much as is possible and knowing exactly what you need keeps you from making bad choices. So, whenever possible, go in with a list. You can also always feel free to add the items in this next section to your cart. Meat and fish will be your main source of lean protein. If you’re a vegetarian, you can skip this section. However, we recommend that you speak with a doctor or dietician to ensure that you’re getting enough protein in your diet. If you can, eat fish, as it’s high in healthy omega-three fatty acids. If you have questions about which cuts of meats are the leanest, never hesitate to ask your butcher. When it comes to the fruit and vegetable section of your grocery store, the good news is that you’re more than welcome to have a free-for-all. Produce gives you tons of vitamins, one of the most important of which is iron. Especially if you’re at risk for anemia, you need to ensure you’re getting enough. When you’re shopping for healthy food, it’s only natural to feel a bit confused when it comes to breads and other grains. After all, it seems like every diet labels carbs as evil. And while it might not be the best idea to eat heaping portions of pasta every night, the truth is that carbs aren’t the enemy. It’s all about a healthy, balanced diet — and some serious portion control. So, go ahead and shop the grain aisle instead of fearing it. We suggest picking up whole grain products, steel cut oatmeal, and even whole wheat pasta. Always make it a point to steer clear of packaged breads and sugary cereals. They’re usually jam-packed with refined starches, which won’t do your diet any favors. While everyone knows that dairy is packed with calcium, few people know that it’s also a great source of protein. With that said, you have to make sure to avoid getting products with added sugar to stay on track. You’ve Mastered Healthy Grocery Shopping: What’s Next? We hope that this post has shown you that healthy grocery shopping doesn’t have to be time-consuming or expensive. While eating right and making sure you’re monitoring how much food you eat every day is important, it’s not the only thing you need to do to stay in good shape. Particularly if you have a larger amount of weight to lost, it might benefit you to learn about a supervised weight loss program. You may also want to rely on dietary supplements to help to increase your metabolism and promote a healthy body detoxification process. Spend some time on our website to learn more about our weight loss program and get in touch when you’re ready to begin your journey.